The best way to break through the clutter, and ensure your direct mail pieces are effective, can be as simple as dipping into your existing piggy bank of customer data and making them stand out to each specific person. Using variable data printing, personalized direct mailers are now easier than ever and can be done with virtually no increased cost. Using an imaginary pet supplies company as an example, let’s explore 3 unique ways to use existing customer information as a tool to personalize your next direct mail piece. Typically, one of the first thing you ask for at online checkout is a name to address your customer either on the receipt, for credit card information, or to ship their package to them. A person’s name is the single most relevant element you can use. 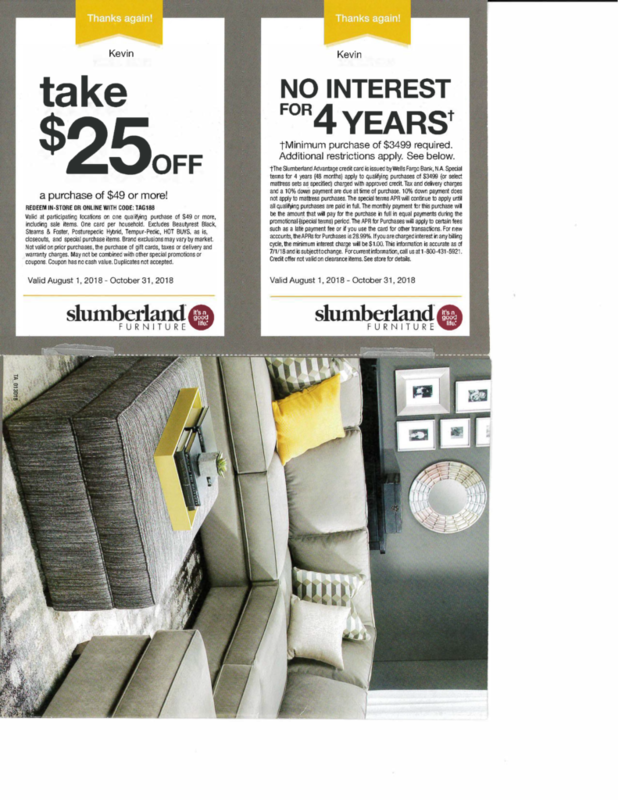 But it’s not enough to just slap their name on the direct mailer in a stock font and size, as this furniture company did. Make it big, make it bold, and make it the feature of your design. When it reaches their hands, it should feel like this glossy, perfect piece of paper is a calling to them. Call out their location by, for example, using variable data to mention your shipping times or proximity to their location. Include generalities about the location like: “Hey Northerner, greetings from Texas!” If you have a group of customer that fall into a specific state you could say, “FREE 2-DAY shipping to Michigan!” You could even take this a step further by segmenting your territory product offerings to fit seasonal weather trends. In our pet supplies company example, booties and vests for dogs would be suitable for people living in Minnesota in December. Bonus points if you can showcase the size of dog that your customer has in their family, which leads us to our next point, order history. You can use past order history to draw conclusions and become bolder with your design and variable data message. If customer purchase history suggests a person falls into one customer segment over another, create designs that resonate specifically with that segment. In our pet supplies company example, identifying dog vs. cat vs. reptile owners allows for direct mail design and imagery that reflects this. Showcasing the type of pet they have purchased for in the past illustrates your dedication to them and their beloved animal, and will likely result in higher response rates. Looking for more creative ways to increase the effectiveness of personalized direct mailers using variable data? Leverage our team of direct mail and variable data printing experts. They can handle everything from design and data input to print and delivery.